2018-2019: See the Neverwas Haul at the LYFT Art Park in Las Vegas! Corner of Fremont Street and N. Las Vegas Blvd. Neverwas Haul, a self-propelled 3-story Victorian House, made from 75% recycled equipment and materials, returns with new interiors, engine, and collections from its travels around the world (i.e., oddities of the Jules Verne era including a Camera Obscura, described below). The Haul measures 24 feet long by 24 feet high and 12 feet wide and is built on the base of a 5th wheel travel trailer. 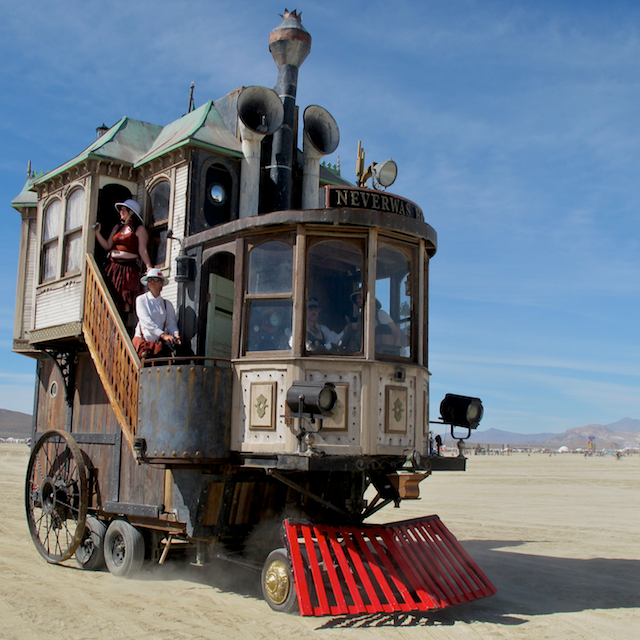 We designed and built the Neverwas Haul as a vehicle to explore the Black Rock Desert for the Burning Man Festivals in 2006, 2007, 2009, 2010, 2012, 2013, and 2015. We have also been featured at Maker’s Faire, Carson City Admissions Day Parade, and the Handcar Regatta. We welcome all like-minded individuals who wish to participate with us in this on-going endeavor. This moving images tour of the Neverwas Haul was taken by the lovely Renée de la Prade and the Culann's Hounds. It's a great song too! Land of Lost Things--Tour of the Neverwas Haul. Here is a brief chronology of Neverwas Haul expeditions over the years. 2009: Neverwas Haul encounters the Raygun Gothic Rocket Ship. 2009: Next to the Man. 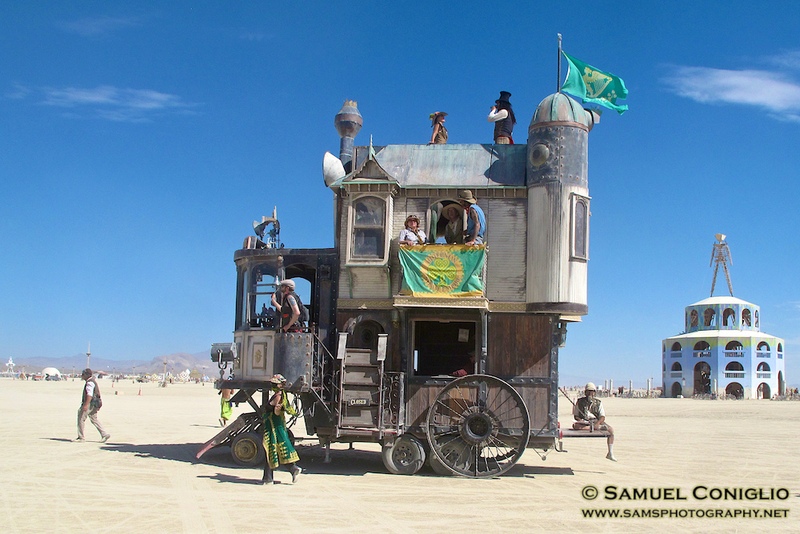 2010: Neverwas Haul tours the desert. 2010: Extended crew family photo. 2012: Neverwas Haul shows its Hibernian flag. 2012: Vintage Photo of the Neverwas Haul and its crew. 2013: Katherine the Librarian and Dr. Professor Samuel Tweed on the Haul. 2015: The Major tows the Haul back home. 2015: Neverwas Haul and a similar sized shoe. The Neverwas Haul photo search on Google. The Neverwas Haul video search on Google. The Neverwas Haul photo search on Flickr.